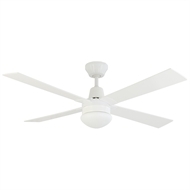 This popular Arlec Classic 4 blade ceiling fan represents excellent value. Featuring new-look fan brackets and blades, efficient design and hard wearing ball race bearing motor, it will not look out of place in most settings and will provide years of solid, reliable performance. It also comes with full LCD remote control, providing ultimate convenience and ease of use.